Sewn With Grace: A Bundle of Blessings! was made in the secret place. Oh, be still my heart. I never see a baby I don't want to hold. He is so precious. We are due to have a new little one to hold in March. That is one of my favorite Pslams...I was reminded of it recently when a good friend told me her son who is 40 and just 2 weeks older than my oldest was diagnosed with ALS. What a precious, precious little one! We are (happily) going through the births of new babies in our family (. . . nieces are becoming Mommies!) - & I just love the times we have together. 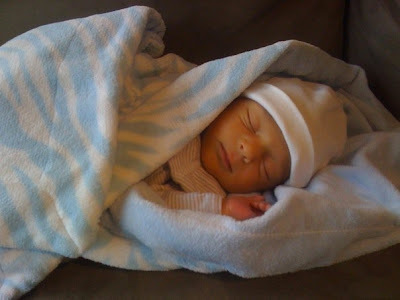 In a few weeks - I'm going to San Diego to visit & get to meet the latest little one (she's not yet 3 weeks old!) & I can hardly wait - especially after seeing this photo! The photo reminds me also of a baby card that I saw. It said, "How blessed are we when they - who are so fresh from God - love us."